Microsoft recently hosted the GLEAM Summit in Dublin, an inaugural conference exploring how best to promote LGBT workplace inclusion around the world. 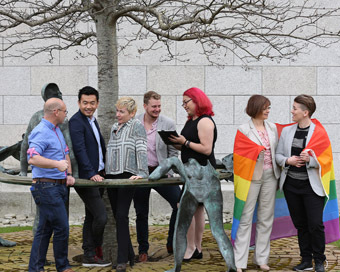 Diversity and inclusion leaders from Microsoft’s global business travelled to Ireland to participate in the conference, which heard from NGOs including the Gay and Lesbian Equality Network (GLEN), Transgender Equality Network Ireland (TENI) and BeLonG To Youth Services. GLEAM is the LGBT employee resource group at Microsoft. Its members play a leading role in ensuring that Microsoft represents an inclusive workplace, while also leveraging the company’s resources to promote full LGBT equality in markets around the world. “We are very proud to host the GLEAM Summit here in Dublin, where we have a strong track record when it comes to LGBT inclusion. The Workplace Equality Index Awards named Microsoft Ireland as one of the Top 5 Best Places to Work for LGBT Equality and you’ll find many of our top executives walking in the Dublin Pride Parade each year. We take the view that there is always more we can do on a local and global level to ensure that LGBT employees are supported at Microsoft, and also in using our influence to promote a more inclusive approach throughout industry. That’s why events such as the GLEAM Summit are so important – they give us a chance to increase knowledge of global best practices for LGBT workplace inclusion,” said Cathriona Hallahan, Managing Director, Microsoft Ireland. Speakers at the GLEAM Summit included Dan Klein of Microsoft Ireland who was named among the Top 50 LGBT Ally Executives in the OUTstanding and FT rankings in 2016. Other speakers included Roland White, Global Director of Diversity & Inclusion, Microsoft International; Áine Duggan, Chief Executive Officer, GLEN and Moninne Griffith – Executive Director, BelonG To Youth Services.